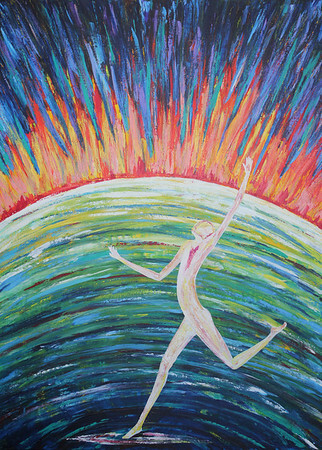 This painting represents the believer’s posture of moving in active faith. Having shaken off the night and embracing the truth that God’s mercies are new every morning and his faithfulness endures through even the most disappointing of times, we are called to move forward planting seeds of hope and light in one another’s lives. As children of God we often know how to repent for sin yet knowing how to live in the power of His resurrection might seem obscure. This is the art of living and moving in His light. His consuming light that invades our soul and heals us from the wounds that sin has inflicted on our hearts. Planting hope and light means sharing the truth of Jesus’ Death and Resurrection resulting in Forgiveness and Healing from sin. What grows is a refreshing revelation. God’s people living in his redemptive design, Eternal life here and now, changes the world we live in as freedom and wholeness destroy the works of the enemy. It is by the blood of the lamb (freedom) and the word of our testimony (wholeness) that we overcome. Building gardens means walking in this and sharing it with one another; being intentional ministers of light. This act of “building gardens” for our Father is designed to be a blessing that multiplies exponentially, bringing the Kingdom of God to its fullness.